GET OUT OF BED, GUARANTEED! NEVER BE LATE AGAIN!!! Instead of letting you snooze, UHP makes you walk to your coffee maker -- or anywhere else you think is NOT YOUR BED -- before it'll turn off the alarm! If you don't get up, UHP will POST TO FACEBOOK OR TWITTER. 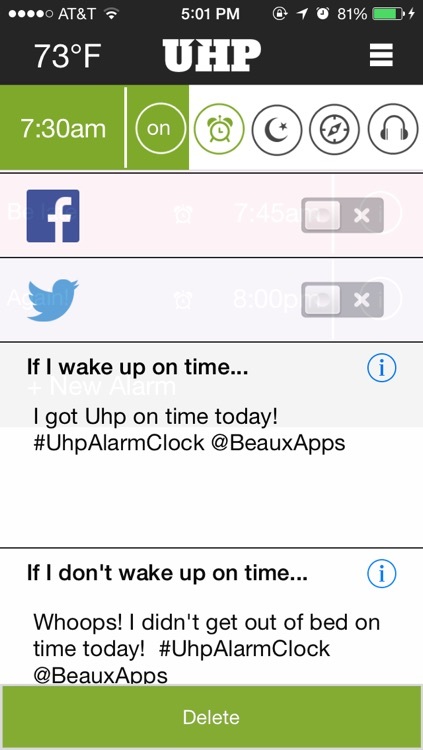 UHP Alarm Clock is the only app with "Path Tracking" and "Social Media" features. Wake up with UHP and make sure you're out of bed when you need to be. 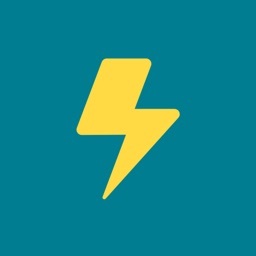 No other app on the app store is using iPhone technology like UHP -- beware of imitators! 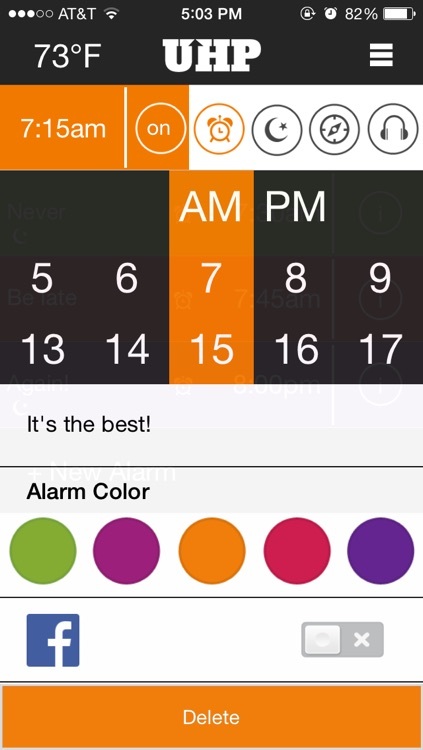 UHP Alarm Clock Pro gets you all features unlocked immediately, and you'll receive all future features for free. 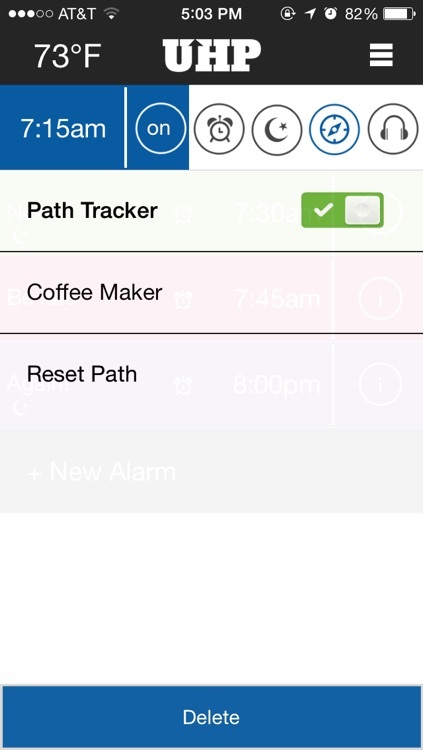 ***Path Tracking Alarm -- UHP asks you to track a path from your bed to the place you go when you first get up in the morning -- the coffee maker, the bathroom, or the front door for the newspaper. When the alarm goes off, you have actually go there again (with your phone, obviously) to disarm the alarm! ***Social Media Alarm -- If you try to sleep through your alarm, UHP can (if you enable the feature) post to facebook or tweet! Nothing like a little social pressure to get you out of bed! ***Snooze Control! 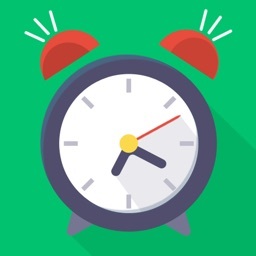 Own the snooze button and set limits on the number of snoozes you allow yourself! No more snoozing into infinity. You decide how many snoozes you're allowed and how long each one can be. ***iTunes Songs as alarm tones! 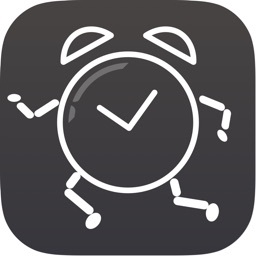 You can wake up to your iTunes songs in the morning or use one of UHP's awesome built-in tones! ***Weather Info to start your day! When you successfully disarm your alarm, UHP will display helpful weather information to help you plan the day ahead. 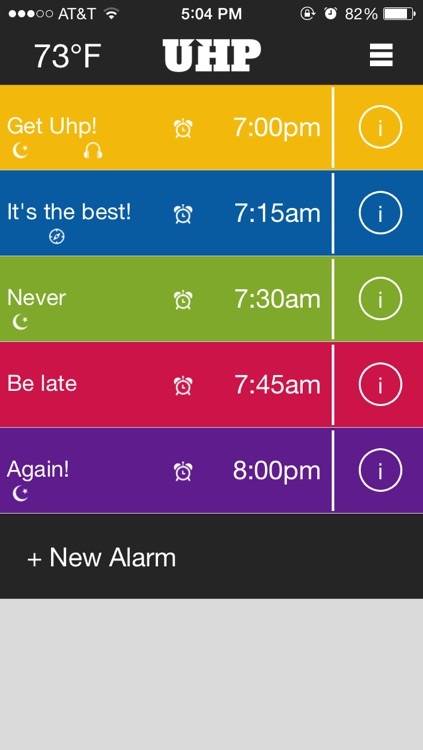 ***Beautiful design & multiple alarm support to organize your days! ***Super smart! 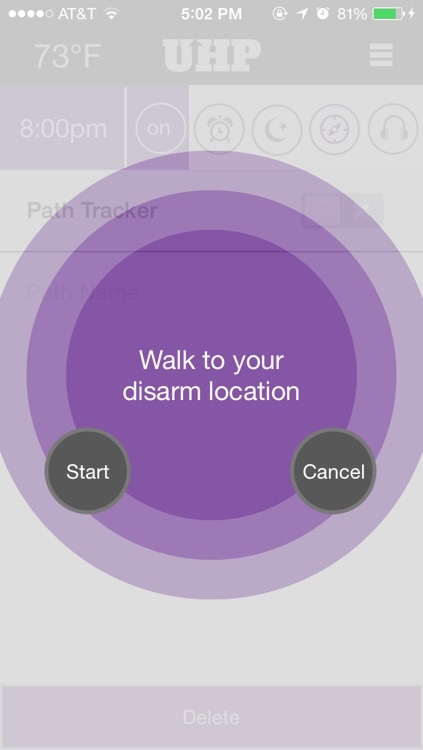 If you set a "Path Tracking" alarm at your house, but forget that it's on while you're on vacation, UHP recognizes the change and won't ask you to walk a path that you can't disarm (it will still wake you up though!). Quick note: even though UHP is super accurate, it doesn't use GPS to track your path, just to verify that you're in a place where you CAN disarm the alarm that is going off. UHP actually uses UNIQUE "smart" algorithms to determine your path inside your house. 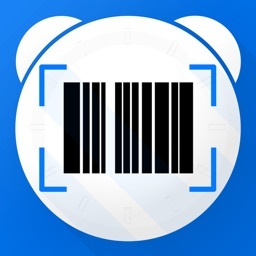 None of the location information about your path tracking is collected outside of the app on your phone. Important meeting, class, or exam tomorrow? No problem. With Uhp Alarm Clock you won't miss it! Chronically late in the morning? 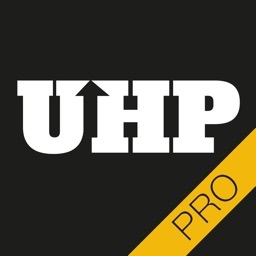 Use UHP every day to help you establish a routine! Learn more at http://uhpapp.beauxapps.com/ & follow us on Facebook & Twitter! "I've downloaded basically every alarm clock app there is. This is the ONLY one that gets me out of bed in the morning. I like to tag my boss on Twitter in the Social Media part so that I HAVE to get out of bed when my alarm goes off or I'll really be in trouble!" -- Kelly J. "HA! This is great! 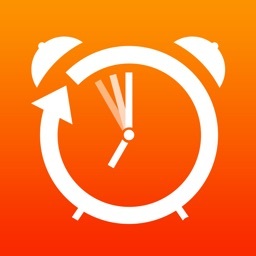 I seriously CAN NOT wake up without coffee, and this app makes sure I get to my coffee maker. LOVE IT."